There will be a Rare Book Open House for LLM students, JSD students, visiting Faculty and Scholars, and new Faculty. It will be held from 11:00a.m. – 1:00 p.m. on Thursday, October 28th, 2010. 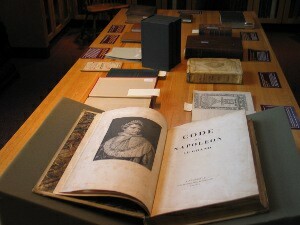 Among the items which may be on exhibit are famous trials, the Psychological Profile of Hitler, Nuremberg Trial Transcripts, old state statutes of Hawaii, and Blackstone Commentaries along with the Code of Napoleon. Please come and see the treasures and have a bit to eat, too.